This is the second in the cookbook series - with special recipes for the Feast of Tabernacles' season. 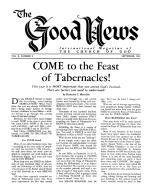 THAT time of year to which all ages look forward with special anticipation is the Feast of Tabernacles! At this festive season some will be planning to eat most of their meals in their cars, or along the side of the road while enroute. There are those who will be preparing their own meals while at the Festival. To help make the mealtimes more enjoyable for all you need to plan ahead of time. How to Plan Ahead. There are some foods which lend themselves more conveniently than others to a limited amount of meal preparation time. Some of the foods which will appeal for use are those which would not ordinarily be considered for common usage when in our homes under less limited circumstances. Due to their short keeping qualities some foods are not practical to take with you or even buy due to the limited refrigeration facilities that may be available.